HUMBOLDT – The county’s Grand Jury has found that problems continue to “plague” the District Attorney’s Office, including poor management, failure to claim grant reimbursements and nepotism. District Attorney Paul Gallegos has responded extensively to the findings, asserting that management of his office has actually improved and that members of the Grand Jury do not understand how grant reimbursements work. Responses to the latest installment of the Grand Jury report were recently filed and among them are Gallegos’ retorts to another critical investigation of his office. District Attorney’s Office staff also complained about “nepotism and favoritism toward relatives of supervisors,” according to the report, which described nepotism as a “problem” in the DA’s Office. The Grand Jury also found that the DA’s Office failed to file for at least two quarters of grant fund reimbursements for the Victim-Witness program in the 2006-07 fiscal year, resulting in “substantial funds being reverted to the state.” Problems with timely submission of grant reimbursement claims “resulted in the loss of revenue for the county,” which had to cover the program’s expenses with General Fund money, according to the report. The report also points out that this year’s investigation picked up unfinished work from the previous Grand Jury. “That Grand jury could not bring the case to a conclusion before its term expired, largely because the principals from the District Attorney’s Office delayed responding to the Grand Jury requests for information,” the report states. On Dec. 8, 2009, using a metal detector in the woods outside Blue Lake, citizen Danny Walker located the remains of Curtis Huntzinger, a 14-year-old who went missing in 1990. Last week, Walker was rewarded with a $5,000 check from the FBI Reward Fund. 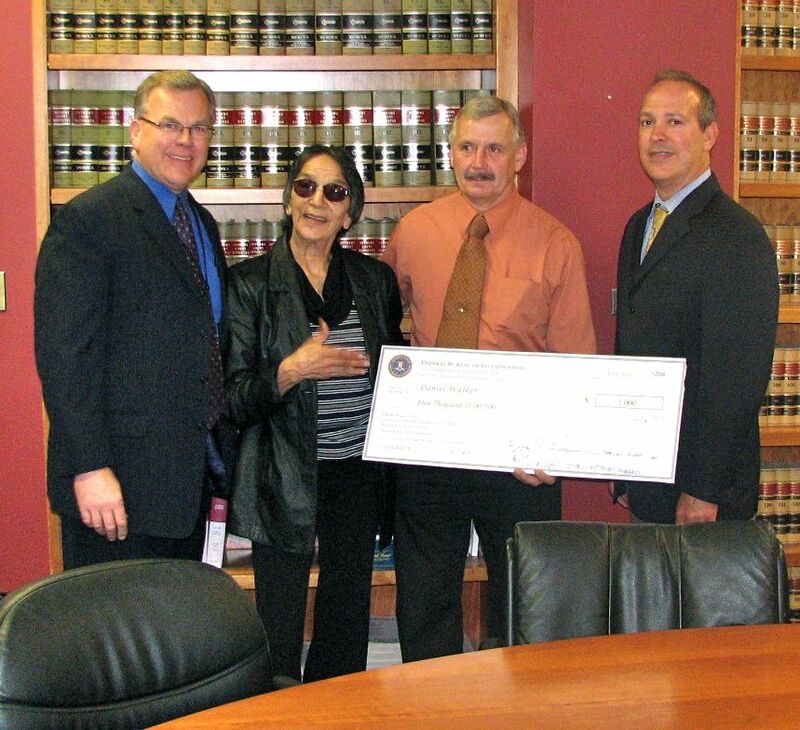 Left to right, DA Investigator Mike Hislop, Curtis’ mother Nancy Huntzinger, Walker and District Attorney Paul Gallegos. Gallegos disagrees with most of the findings. He states that the alleged delays in getting responses to Grand Jury inquiries are due to their being simultaneously submitted to the County Counsel’s Office. Another problem, Gallegos continues, is that the inquiries were submitted to DA’s staff instead of Gallegos himself. Gallegos describes the improvements he refers to. “The District Attorney has strived to bring the current office into the 21st century, has established departmental policy and procedures that had been lacking, revamped the criminal division by establishing felony/misdemeanor mentorship, developed more efficient and effective procedures for getting work accomplished within budget constraints and developed partnerships with local organizations to maximize our services to the people in our community,” he states. On the allegation of failing to capture Victim-Witness program reimbursements, Gallegos says that the Grand Jury has got it wrong. “All quarters were submitted,” he states, adding that documentation was provided to Grand Jury on June 2, 2009, along with copies of cancelled checks from the state and revenue deposits into the Victim-Witness account. He does agree with the recommendation to establish a county grant management committee, however. On the nepotism finding, Gallegos describes the situations he believes the Grand Jury is referring to. Drew Duncan, the DA’s archives clerk, is the son of Jeannie Duncan, the office’s legal business manager. But Gallegos states that Duncan works under another supervisor and not his mother. The county’s nepotism policy does not include in-laws in its definition of “relatives.” It also allows exceptions, as approved by the personnel director, if a position requires extraordinary qualifications. Dawson is paid through an annual $50,000 State Auto Fraud Grant and works three days a week. Gallegos emphasizes Dawson’s “40 years of experience as a law enforcement officer,” including 10 years of work as a chief investigator in the DA’s Office. The DA “agrees, in part” with the finding on personnel evaluations, however. Personnel evaluations have not been done “consistently and systematically” since 1991, he states. Evaluations of administrative and Victim-Witness staffers was done in 2009, but “there have been gaps between 1991 and present and some employees did not receive consistent employee evaluations or there is not record in the employee file to differ,” Gallegos adds. The County Administrative Office responded to some of the recommendations, stating that a grant management committee can’t be implemented because it would require additional staffing, and that the revision of the nepotism policy and establishment of a personnel evaluation ordinance are not necessary because current policies suffice. This entry was posted on Saturday, October 2nd, 2010 at 6:59 am	and is filed under News. You can follow any responses to this entry through the RSS 2.0 feed.